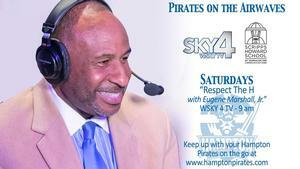 'Respect The H' to Debut on WSKY TV-4 Saturday, August 25 at 9 A.M.
HAMPTON, Va. (Aug. 24, 2018) – A new Saturday morning television show featuring Hampton University Athletics will debut this Saturday at 9 am as “Respect The H with Eugene Marshall, Jr.” will air on WSKY TV-4. Joining the show this week with a special appearance is Head Football Coach Robert Prunty, along with the Director of the HU Marching Force Dr. Thomas B. Jones. This will be a new way for Hampton fans to keep up to date with athletic happenings, as Hampton makes its debut in the Big South Conference. Keep an eye out for more guests and new features to the show which will run through the football season. The show is being taped in the state-of-the-art TV studios in the Scripps Howard School of Journalism and Communications. For more information on Hampton University Athletics, please contact the Office of Sports Information at 757-727-5757 or visit the official Pirates website at www.hamptonpirates.com.